Ever glance off at a pretty sunset only to feel your car tires jarring along the roadside? Truth is, if we focus exclusively on driving between the yellow lines, we avoid veering. We can apply this principle to our life and marriage as well. Napoleon Hill once wrote, “Every man is what he is, because of the dominating thoughts which he permits to occupy his mind.” He’s not alone in his thinking. Thought leaders through­out time agree that our outcome begins in our mind-set. We find what we look for. We become what we think about. Their wisdom suggests that when we focus on fixing our issues, we unwittingly perpetuate our problems. 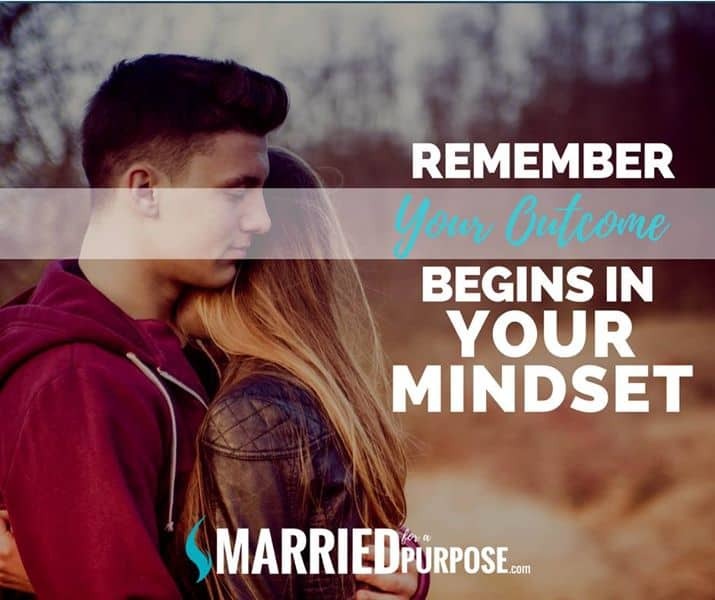 However, when we focus on our desired outcome, aligning our thoughts with God’s pur­pose, we reap the benefits of living His design for our marriage. As a couple, what do you tend to talk about? Where do your thoughts most naturally gravitate? If you want to live a higher way of living—God’s way of liv­ing—in your marriage, create new habits of thinking. Instead of thinking and talking about your obstacles, consider God’s pur­pose. Instead of focusing on the problems in your relationship, consider what you both agree on and desire as an end result. Instead of pondering what you want to change about your spouse, consider how your differences make you stronger. Envision your desired outcome and welcome God’s perfect plan for your mar­riage, knowing your outcome begins in your mind-set. ° Answer the following questions together: What is our desired outcome in our marriage? How is God calling us to shift our mind-set? What is His vision for us as a couple? How will we align our thinking with God’s to better celebrate each other and welcome His design for our marriage? ° Each day, make a conscious effort to focus your thoughts, energy, and prayers specifically on your desired outcome—especially when you’re tempted to think otherwise. ° Pray together daily, asking God to help you look past the obstacles and instead see His vision for your marriage. Father, empower us to see your vision instead of our obstacles. We want to celebrate your unique purpose for our marriage and see the beauty in our individual design.